This started out as a 10 year old faded pink, purple and white Barbie jeep that was given to me by a neighbor. My daughter requested it to be painted orange, and I decided to upgrade it to 2wd and 12V. Things were going great until I was testing everything out and found my F/R switch was bad. I just ordered a new switch from Hobbymasters and as soon as it gets here I should have everything back together and running before too long. Here are some shots of the work in progress. I ran new 10awg wires throughout, and have 2 new 6V 12AH Gruber batteries for power. Now the problem, she is only two and does not get "steering", the 12v and twin motors make this thing FLY. So much so, my kids now fight over it (boy 4 girl 2) My son wants to ride the little Jeep not his super shock dirtbike because the Jeep is so much faster and he can pull wheelies in it. Last night the daughter was running circles in the back yard (again she does not get the steering part) I turned my back and she had straigtened it out and was going full blast at the back fence, Dad caught her, but that thing flat moves out! Well I got everything put together tonight, and took the jeep out for a little test drive. Everything works great, unfortunately after my daughters initial ride, which lasted all of 10 seconds, she decided it would be more fun to push it around then drive it. I guess we'll have to work on driving when she's ready. We then decided to see how my 10 month old son would fare. I don't think he was too impressed with it. Here are some shots of the finished Jeep. The black paint on the wheels started to come off as soon as it hit the pavement, showing the white plastic underneath. Luckily Colinsmom is sending me some black plastic wheels that I'll be putting on. I added the High/Low switch in the place where the CB Radio would have been. The jeep was missing the radio when I got it, so it looked like a prime location to mount the switch. For now we'll just be using it on Low until she gets used to driving. Here's a shot of the power source. 2 6V 12AH GPS batteries. I'll be designing a battery hold down next. And Finally a couple shots of the underside. Once it starts getting colder out I'll probably run new wires again and clean it up better. That color looks dang good.. the lil wrangler updated to 2wd and 12v is still one of my favorite mods to date.. they are quick and will climb anything when configured that way! Thanks Wheres. I'm pretty impressed with how the lil jeep runs so far. I can't wait to see it in action when my daughter is ready. I've definitely caught the modding bug for these, and find myself searching craigslist and ebay regularly for new ones now. I'm a modder by heart, having spent the last 10 years restoring/improving a 1969 Buick GS, so now I have another hobby to work on (one that is much easier on the wallet), and share with the kids enjoyment. I just picked one of these of for $10 & want to do the 12v, 2wd upgrade. What's the advantage of going with 2 6v rather than 1 12v battery? Your jeep looks really awesome! I don't think it's advatageous to do it one way or another, just a matter of preference, and configuration. I also found the 2 6V 12AH Gruber batteries were just the right size to fit under the hood. I'm not sure how big a single 12V 12AH battery would be (a lower AH would be smaller then a 12AH though), I'm sure someone else has more experience with the 12V batteries, and could answer it better. This also leaves me the option to add another 6V battery if I should ever choose to go to 18V in the future. I've read differing views on whether or not it's a good idea to mix 6 and 12V batteries together, so I just figured I'd keep them all the same volt. I did the 2 wheel drive 12v mod too and it was a HUGE improvement. I used 2 12v 7ah batteries for the fit. On my nephews Lil Wrangler we added a single 12v 12ah Power Wheels battery (brother-in-law had just bought it). We cut a hole out in thee hood so the battery could stick out the top then screwed the fake plastic motor on top. It turned out pretty good! Will have to get photos soon. Well I got my new black wheels from colinsmom, and cleaned and painted them up. They are ready to go on now, unfortunately I ran out of the smaller size cap nuts, which the front axels use for some reason, so as soon as I get them the wheels will be on. Here's a shot of them. The largest PW brand battery is a 9.5 AH, not a 12 AH. I'd consider a 12 volt 7.2 AH (12 volt 8 AH's are the same size also) battery. For a smaller vehicle like this, it should still give you about an hour of run time, and it quite a bit smaller then the 12 AH's. They are also usually available locally. That Jeep is looking pretty cool! One thing I've seen a few people do, that seems like a good mod, is bracing up the steering stem to reduce some flex. I think that bracing up the steering, and maybe improving it is next on the list. I finally got my daughter to ride in it today. She's sticking to the low setting for now since she is new at steering and stopping. My nephew was using it on high, and I definitely noticed a good amount of flex in the front wheels when he was riding in the grass and dirt. I took some videos this afternoon, now I just need to upload them. I picked up the new small cap nuts and mounted the wheels. Much better in my opinion. And here is my nephew Connor running it on high at 12V. He's had a little more experience with these, so he had pretty good control of it most of the time. WOW that looks great. I wish you had a picture of the before. This gives me some motivation for my lil red jeep I got. Could be great for my 2 yr old. It already has black tires but is missing LOTS of parts. "Time to take a ride on the information superhighway." Man, that paint looks better than factory.... well the whole jeep does.... great going! Those little motors can do that? Well just to give you an idea, it was a pink Barbie jeep, but it was so sun faded, it was starting to look almost white. When I removed the stickers the pink underneath them looked like vibrant hot pink next to the faded pink. The body was pretty sound though, only one small crack that I was able to fix. This one is still my daughters favorite, and she asks to ride it everyday. On 12V it's pretty fast since there isn't much to it. I did pick up a piece of aluminum angle rod that I'm going to add to stiffen up the steering. I'll probably add that on this weekend if I can find the time. What type of motor did you add for the extra drive? I tried the search option but didn't find anything that described the details of what you did. Can you post a closer picture of the extra motor? I just picked one of these up for $15 and wanted to give it an upgrade; my first mod. I was considering welding up a lightweight frame out of square aluminum, mounting the motors to that frame for the rear drive and then building a better steering mechanism. 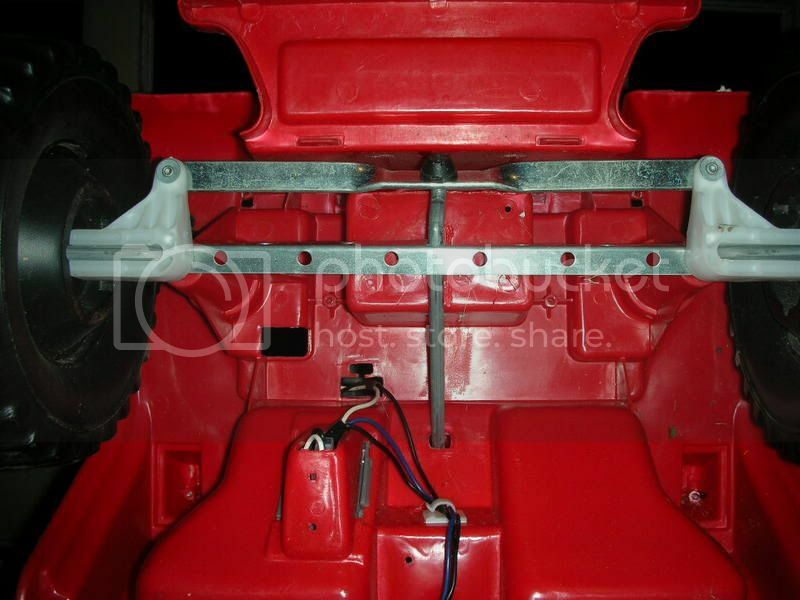 Similar to the Kid Trax fire truck frame. I figured this way, I could raise it slightly (1"). Just not sure which motor to get for this. I haven't pulled the existing off yet to see if a replacement for this would match up or not. Any idea or is there another, faster motor I should go with? I used another standard 550 motor and gearbox I got from another member here. I replaced the single 3A gearbox with two 3B gearboxes since they were easier to come by, but I would eventually like to put two 3A gearboxes on it. If you are able to come across used Super 6 motors, they are faster than the standard 6 and 12V motors, and on 12V they really go fast. The other option is to buy aftermarket 550 motors from a place like Tower Hobbies, or Robot Marketplace. Those motors don't come with pinion gears, so you would also have to buy those (member Gameboy has the pinion gears for sale). There have been others who have used #7 gearboxes on these lil jeeps, but I think the #3s work just fine if you stick to stock wheels and 12V. I thought there was another post on here where a member lifted on of these, I'll have to look around to see if I can find it. If you search on Lil Jeep and Lil Wrangler you should come up with a bunch of posts on it. Here are some close up shots of the underside. Close up of wiring to the High-Low switch in the dash. Here's the thread I was thinking of. He lifed the lil jeep, and added larger wheels with #7 gearboxes, and standard 550 motors. The best way to increase speed on these lil jeeps is to make them 12V. Making them 12V with faster motors might make them too fast depending on the motors used. Super 6's on 12V are still not too fast, but those aftermarkets on 12V on the lil jeep might be too wild depending on the driver. I finally got around to bracing up the front end today. I cut a piece of aluminum angle rod to fit and it and I could feel the improvement just pushing on it now. I'm hoping to get my daughter out for a field test tomorrow since the weatherman says it should be up near 60. Olivia took the jeep out for a ride this morning. It wasn't quite as nice as they said it was supposed to be, but it wasn't too cold either. I think she'd be happy riding in a blizzard as long as it moved, but I prefer to be out there on the warmer days. The jeep performed great with the steering brace, it turns on a dime now with no slop at all. She was power sliding all over the driveway. Just got my daughter the Barbie version for X-mas. Didn't know it was one-wheel drive, so I'm looking to make it 2-wheel drive. What gearboxes did you use, and where did you get them? Been searching and not finding much so far. I did pop the gearbox out of this one to see what numbers were on it. All I was able to find was "2458022" and "175802". I ended up using two 3B gearboxes (with the pentagon driver) instead of finding a second 3A gearbox (round driver) since I had an easier time finding the 3B gearboxes. Unfortunately Fisher-Price does not sell new gearboxes and motors seperately, so you'll have to find a used one. You can post a thread looking for one in the For Sale/Wanted to Buy section, search on ebay (the 3B gearboxes usually show up there), or search Craigslist. Usually you can find used Lil Jeeps like that one on Craigslist that you could use for parts. Good Luck, and give us a holler if you need more help. Thanks! I did read the gearbox thread and the FAQs. From what I was able to figure, my Daughter's Jeep has a 3A (round driver, 6V) box in it. I was just wondering if there's a good source for the gearboxes. Found a seller on Ebay, morgandsmom, that has a couple of gearboxes for sale. They look like 3B boxes. Anyone have any dealings with them? Quick question, either of the gear boxes should work in the white plastic wheel drivers, right? Yes, any Powerwheels wheel driver will work with any PW gearbox. Just don't mix one gearbox type with another since they have different final drive ratios. There isn't really a good source since you can't buy them new, you just have to look around for used ones. I haven't dealt with morgansmom before, but I did see that some of her items did seem really overpriced though, while others did not. in the sence that its cut on both sides. the tiny bit of metal thats left in the center isnt very strong. yours may be ok depending on the thickness of the metal. mine is thin,it flex and pinch the steering shaft. **btw great project you got here! we can't ride...unless its modified! I noticed your alum.angle front brace looks alot like mine, in the sence that its cut on both sides. the tiny bit of metal thats left in the center isnt very strong. yours may be ok depending on the thickness of the metal. mine is thin,it flex and pinch the steering shaft. I did try putting it in front at first, but I was having clearance issues with the steering rod angle. It was probably the way I had cut the angle rod. My primary concern was eliminating the flex from the plastic axle supports, so I cut the rod to fit around the plastic posts without any extra play, and it does that job well. The by product of how I cut it around that plastic is that it does eliminate some of the plastic flex around the steering rod guide. I did end up cutting it a bit thin on one side, so I may revise it. I have a 6ft section of the rod, so plenty more to try out different installation methods. I'll post if I make any changes and the results. Well the torch has been passed now. Robbie has started learning to drive the Lil Jeep. He's been doing pretty good with it so far and having a blast with it. He holds on the steering wheel, but hasn't figured out that turning it will make him turn. He's been riding on low speed, but he does like to hit the switch occassionally and always get a big smile when he does. Olivia still drives it now and then, mostly just when Robbie's finished, but she likes the faster ones now. Memphis still goes back to his little jeep every now and then but the buck reigns right now. That's the one he always picks when we go out for him to ride. That still is my favorite mod. Quick and easy. It's a fast little bugger. Think that one will go to my niece when she turns 2. Robbie has been out driving the Lil Jeep a few times now. He's an expert with the pedal, but we're still working on the steering. At least he's holding onto the steering wheel while he drives. It took my daughter about a month at nearly 3 years old to hold onto the steering wheel.